How many of us have found ourselves in the situation where we had to substitute our dining room table for the unpredictable, terrain of the outdoors, only to figure out that we needed something more practical and more versatile to accommodate our many activities? We know that you’d bring your dining room table out with you if you could, especially if it could fold and pack away in your car. However, that wouldn’t be practical, now wouldn’t it? 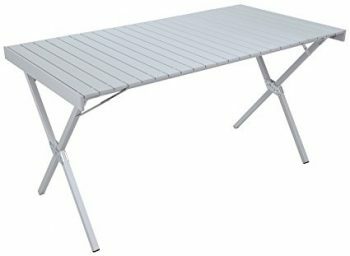 So we set out on a search for the best folding table out there so you can have a nice family breakfast or lunch while camping. After all, there’s nothing more beautiful than dining in style, surrounded by Mother Nature. Considering what you would be using your folding table for, there are some key features that play a key role in deciding which ones may be best for your activities. So what matters most? For activities such as camping, tailgating and family get-togethers, it’s important to consider size, weight, ease of setup & takedown, portability, versatility, durability and maybe in some cases even affordability. Some folding tables cater for small groups and pairs, while others cater for larger groups and teams. The best camping table will cater for dining, storage or serve as cooking stations. However, no matter what the function, there are some positive deal breakers which may tip your interest in deciding which table on our list really serves your purposes and may qualify for an all-rounder. Being easy to setup and takedown your table is by far one of the most important things that you may want to consider. I mean who wants to spend half an hour (just hypothetically speaking), reading instructions when all you want to do is get things in place and start having fun? But if you don’t mind the extra few minutes, then by all means, you can go for it! For this particular feature, from the products on our list, the ALPS Mountaineering, The Lucky Bums Quick Camp and the GCI Outdoor Slim-Fold scored highest. Now we have gotten to the meat of the issue for a lot of people. It doesn’t cut it to have a fancy looking or expensive product on your hands that’s going to tip and flip over every time you put something on it. That’s completely defeating the purpose of having the table in the first place. Not only should your table be able to hold a decent amount of weight, but it should be able to withstand the outdoor elements. In terms of how stable the table should be, it’s advisable to get a table which has legs set far apart from the center to allow a fair distribution of weight and to reduce shakiness of the structure, which if not addressed, would cause your food or gear to tumble. The ALPS Mountaineering and the Coleman Pack-Away scored highest in this category. This basically refers to how heavy and compact the table is, and how easy it is to carry. So with that in mind, the lightest table would be the most attractive one to consider. You should also consider how easy it is to store away into your car or camper or even carry along on your shoulder. In this category, the ALPS scored the highest for us and the weight depends on which size table you decide to get. After takedown, you can store this awesome table in its handy carry bag and tote it on your shoulder. Though, if you’re at a tailgating event and you probably have your car nearby, then the GCI Outdoor Slim-Fold would come in a close second. Based on the overall layout of the tables and the materials used in their construction, being able to withstand the elements that the outdoors have to offer and the terrain that these tables would encounter, is quite a big deal. Not to mention being able to survive many years in the family would earn these tables a great reputation. In this category, the ALPS Mountaineering and the GCI Outdoor Slim-Fold scored the highest for adults, due to their simple yet sturdy construction. The SUNVP and the Lucky Bums made it for the kid’s department on top. It’s important for us to consider what verified customers had to say about the folding tables available on the market. This way, we can provide you with some insight into these products from actual users, so you can see and read for yourself what experiences they had. Best Use: Camping, backyard barbecues, family get-togethers, tailgating. 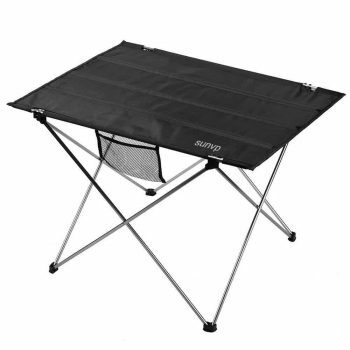 The ALPS Mountaineering Folding Table is an outdoor pal, which makes its uses almost infinite. The table is great for the average height person and sets up without too much fuss. You can also sit up while moving around cooking or eating. When your table party or lunch is done, you can simply collapse the table and snug it into a carry bag (provided with the table) which can go on your shoulder. So it’s easy to setup and to pack and store away.This means that your days of lugging behind a bulky table are over. And being durable as well as lightweight is another bonus to add to this package deal. Some people weren’t too happy with the height of the table and that the legs weren’t adjustable. However these tables weren’t really meant for you to be standing around now were they? Nope! Anyways, most customers felt that this product was “fantabulous” and 88% of customers gave this product 4 or 5 stars. Best Uses: Camping, car camping, fishing,tailgating and for organization while off the grid. 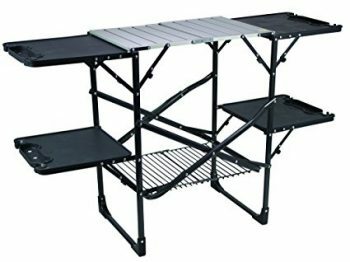 The Sherpa Camp Table & Organizer is great for whenever you want to cook some fancy meals while out camping. The aluminium top is very useful for both preparing the meal and eating while the 4 removable storage bags are amazing for storing everything you need from utensils to ingredients. Even more, one of the bags is equipped with a special lining to hold water – this means you can use it as a sink. The table packs up just as easy as it sets up and all you have to do is place the bags in their compartments, pack up the legs and you’re done! The obvious unfortunate drawback is, of course, this table’s height, which runs a little on the short side when thinking about using it as a prepping or cooking station. Unless you’re rather short, then that fact won’t bother you at all. The surface area is also not much to play around with, but is still has its advantages. Other customers also claimed that the table took too much of a hassle to set up and take down. However over 88% of customers were extremely happy with their purchase of this product. Special Features: Kitchen includes paper towel holder, condiment racks, removable sink basin, pantry shelf and a lantern hook. Best Use: Camping, Fishing, group trips, family get-togethers in the outdoors. The Coleman Pack-Away Deluxe Kitchen is equipped with a full-size aluminum frame that expands.If you’re not the kind of person that wants to sit around deciphering a sheet full of instructions, this snap-on tableis the right stuff. The table comes with a side stand where you can fit one of the most popular stoves and coolers from Coleman and there is a separate surface where you can prepare the food. Need some help with cooking at night? The table is prepared for this situation too! There is a lantern hook that can be used for hanging up a lantern or anything else. Also, the table folds up in a compact package that can be easily stored in the trunk of your car. Most customers were very happy with their purchase once they started using it. It really has made their camping and other outdoor experiences worthwhile and even more fun. 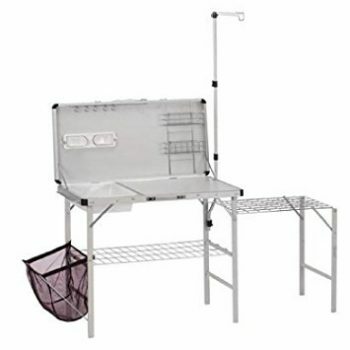 Special Features: Four multi-use fold-out side tables – beverage, wine glass garbage bag, paper towel and utensil holder (weight limit per table: 30 lb/13.6 kg), Aluminum counter top (weight limit: 48 lb/21.8 kg), Lower rack for storage/dry goods (weight limit: 35 lb/15.9 kg). Best Use: Tailgating, Camping, picnics. The SLIM-FOLD Cook Station from CGI is equipped with an aluminium top, for protection against scratches and other cooking accidents and a storage rack for easy use. To increase its usability, the table comes with 4 plastic side tables that fold out. Nothing has been more useful than this product right here. It truly is a seasonal product, not just for the holidays, not just for tailgating. It’s that type of product that is completely family friendly. And let’s talk about the fact that no assembly is required, that should just blow your mind right now! And let’s also talk about lightweight. 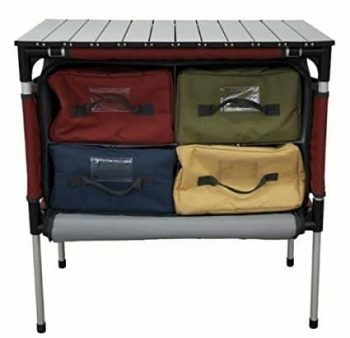 For a folding table that holds over 200 pounds, when folded down, you can carry this and pack it away. It takes up the same space that a folding chair would take in your car or hatchback. 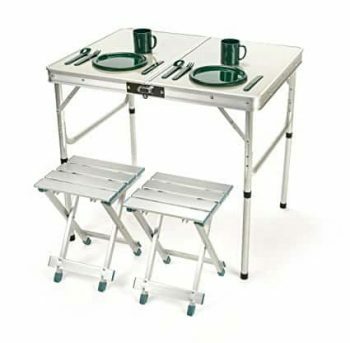 This Trademark Innovations Folding Camp Table with Stools is lightweight and comes with 4 stools so a family can definitely enjoy their meal. The entire ensemble folds up as a suitcase and you can easily carry it around. Several people commented on this product’s versatility and compact design. Being lightweight was an extra plus for them. This set is so functional and so lightweight, that we bet you’d be taking it everywhere you go. Set up in style and comfort with ease at your favorite entertainment events. Special Features: Made of ultra-light aluminum alloy + waterproof oxford cloth, Anti-slip feet to increase traction on various surfaces, A handy carrying bag is included for easy portability and storage. Customers who purchased this table didn’t have anything negative to say really apart from the small size of this particular version. But hey, different sizes, different uses right? All in all, we think that this table earned its place on our wish list. Special Features: Made with coated steel frame and 600D Oxford fabric to ensure long life, comes with carrying sack for easy transportation, has two built in drink holders. Don’t let the name fool you! This is no stool or chair of any kind! The Lucky Bums Quick Camp Table with Cup Holders is the ultimate companion for the ‘young’uns’. It’s lightweight and gives the kids their own little ‘my’ space to enjoy their meals while out camping or picnicking or just enjoying a sunny day in the backyard. Pair it up with a couple of kid’s camp chairs for a wonderful ensemble. Available in five vibrant colors to match any kid’s mood, these tables setup and close-up in a matter of seconds and fold away into a convenient case that the kids can carry themselves, making them feel super independent. Now we know you can think of more than one use for this table, but more than likely, your kids will come up with their own. A few customers voiced their dissatisfaction with the quality of this table and claimed that it ripped along with the matching chair. However with a super-clad total assurance guarantee in effect, it’s not that difficult to turn those frowns upside down, especially if the damage was due to manufacturer defect or associated fault. When you receive a Lucky Bums product, if you are not 100% satisfied with your purchase, let them know right away. The manufacturer has promised to replace it immediately. Now with security like that in your pocket which is as good as cash, how can you not want to get one? The overall customer satisfaction was so favorable it scored an easy 91%! 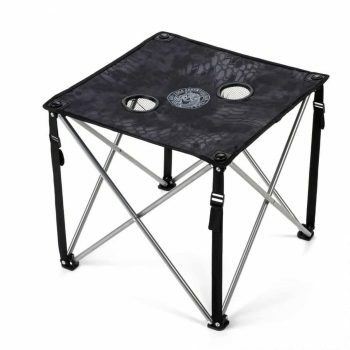 So the next time you want to go on an outdoor excursion whether it’s a small party or a team of folks, there’s a lot to consider.But, when you get down to brass tax, having a folding camping table that meets your expectations as well as fulfills most if not all of your needs is the key here. True having one is a great convenient commodity and would be quite useful in any circumstance, but having a clear idea of what each is built for, and the features it has to offer, would make your job of selecting the right one for you and your family or friends that much easier.